O Blessed Day. For Gore is Anointed! It had rained and rained and rained for days. But today I woke, and the sun streamed in my window. For Gore has been anointed! So many years wandering in the wilderness, shunned, even ridiculed. But now, at last ... Anointed! It is a story of biblical, mythical proportions. But we don't have to go all the way back to any Old Testament prophets such as Noah or Moses. We don't even have to delve into the legends. It is not so often that life imitates art in such a way as it has today. We need look no farther than Gore's own masterwork, "An Inconvenient Truth," for a deeper understanding of what has happened today. Much like the film that took the Oscars by storm, today's enNobeling of Gore is a triumph of dreams over reality, faith over fact, superstition over science. Gore is not honored alone. With him on the pedestal, crowned with laurels, is the U.N.'s Intergovernmental Panel on Climate Change. Not since the UN's corruption-enabling nepotist Kofi Annan was so honored with his own peace prize in 2001 has a Nobel been quite so irony laden. (Unless you are one of those cynics who consider more ironic the enNobeling of Jimmy Carter in 2002 and Mohammed el-Baradei in 2005, presumeably for setting the terms of the wars that great peacemaker, George Bush of America, is now fighting). As in any great legend, our heroes have feet of clay. 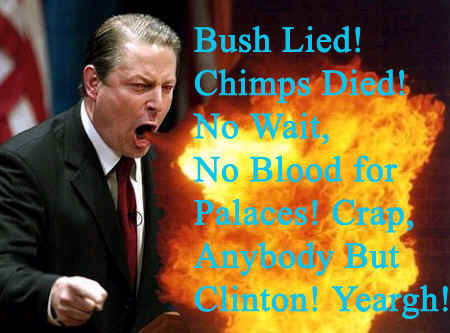 Gore, or course, has been meanly chastised for doing not as he says. Like a Biblical prophet who may doubt God or be enticed by the Devil, so does Gore in greatness illustrate his own flawed humanity, with a carbon footprint as big as all outdoors. Is it wrong that a great man should have a house that burns more electricity in a month than the average peasant's home does in a year, or that he should maintain a fleet of chariots fueled by sweet oil? Render under to Caesar that which is Caesar's! Vex him not! The great panel of scientists honored today with Gore also has been attacked by petty jealousies, and the suggestion it was not the unanimous acclamation of global warming theology it was purported to be. But there will always be small-minded men nipping at the feet of greatness. And it was merely inconvenient that a judge should, just this week, point out some untruths in the great man's great work. "Political indoctrination" ... I ask you. As in biblical times, shall we see them struck dumb, gnawing their tongues for pain. The chattering of those without faith will be no hindrance. So anointed, where will the prophet lead us? Which mountain will he climb? Today is a great day. As the prophet seeks to lead us from the wilderness, forget not that the path ahead is fraught with dread perils. But we have been blessed this day with a champion! Read more Jules Crittenden at Forward Movement.